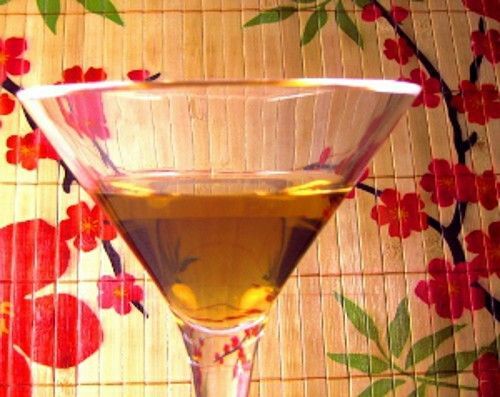 The Cabaret cocktail adds Benedictine and bitters to the gin and vermouth from a traditional martini. Benedictine is a sweet liqueur that tastes a little like cognac, only sweeter. The flavor of this one is herbal and sweet. Both gin and Benedictine are pretty distinctive flavors that not everyone loves, so this drink is admittedly not for everyone. But if you find you enjoy it, it’s wonderful to relax with, or anytime you’re thinking of something like a martini. Fill a cocktail shaker halfway with ice cubes. Pour in all your ingredients and shake well until chilled. Strain the mixture into a chilled cocktail glass. Garnish by dropping a maraschino cherry into the drink.